A nice view of the dining room, set between the living room and the kitchen, with fir floors and a pretty bay window. Entrance with open staircase leading up to 2 bedrooms, and hallway to the full bathroom (just a glimpse of the clawfoot tub!). Tall ceilings, bay windows, fir floors, and an open staircase preserve the historical charm of this Hilltop home. You’ll love the space and light in the living and dining rooms, and you can pull a stool up to the bar counter in the kitchen for casual meals. Carefully maintained landscaping welcomes in the front yard and continues in the fully fenced back with paved paths, sculpted lawn, and a low deck. Both bathrooms are found on the main floor with 2 bedrooms above. A backyard path leads to the 2 car garage with shop space. 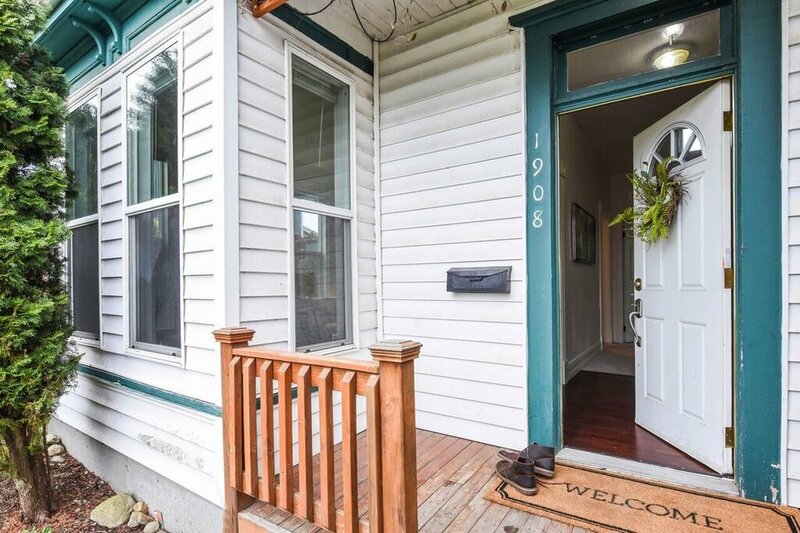 In the Hilltop Neighborhood of Tacoma, this home is centrally located with easy access to transit and downtown. If you're starting to love this home, would like a closer look, or just feel a bit curious, stop by this coming Sunday, April 15th from 11 am - 2 pm for an Open House. I'd love to see you there! In the meantime, for more information call or text me at 253-226-2787. Continue on for the video tour, photos, neighborhood highlights, and more details about this home. Living room view with that nice arch over the bay window nook facing east. On entering the house, take the open staircase to the bedrooms on the second floor, follow the hall back toward the full bath, or head in here, where the bay windows let in light and breezes. The fir floors in the living room are stained a rich brown to contrast with white trim and walls. You'll find the same beautiful original floors in the dining room where another bay window provides space and shape. Bay windows give space and interest to the living room and bring in lots of light. The living room leads into the dining room and opens into the hall providing a nice flow to this mail level. Tall ceilings, fir floors, and another bay window in the dining room make it a pretty space that can be dressed up for special occasions and made cozy for everyday. A reading nook and bar counter are sweet details in this practical kitchen. In the kitchen, friends and family can settle on stools at the bar counter to visit while dishes are done for food is prepared. It's a good place for a cup of coffee or weekday breakfast too. There's even a cozy little reading nook in here! 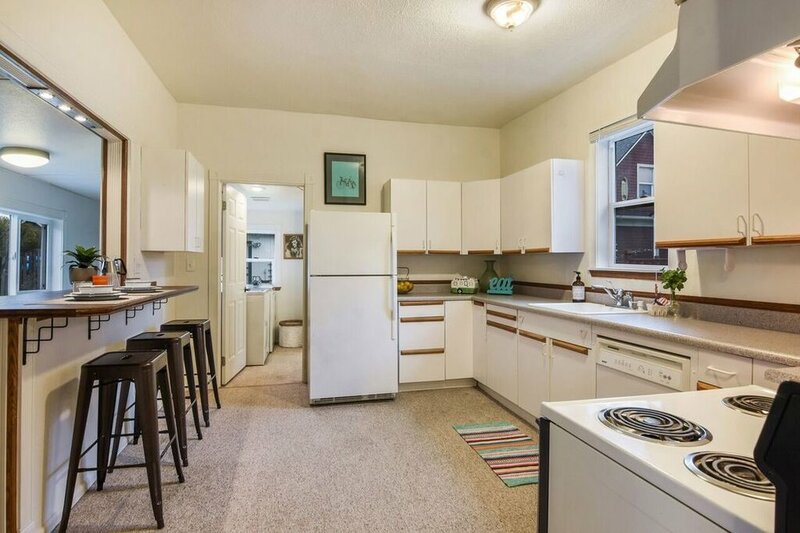 Ample cabinets, a window over the sink, a pantry, and complete set of appliances make this a practical, pleasant kitchen. There's a pantry space behind the curtain, and a door leading out to the deck and beautiful backyard. Looking into the kitchen from the dining room and through to the laundry room. A window over the sink and windows on the other side of the bar counter help bring light to the room. Full bath with clawfoot tub and shower, vanity, and vinyl floors. This full bath with its clawfoot tub and vanity is found at the end of the front hall, but there's another bathroom too! A 3/4 bath with a shower is accessed off the utility room and is reached conveniently from the kitchen. 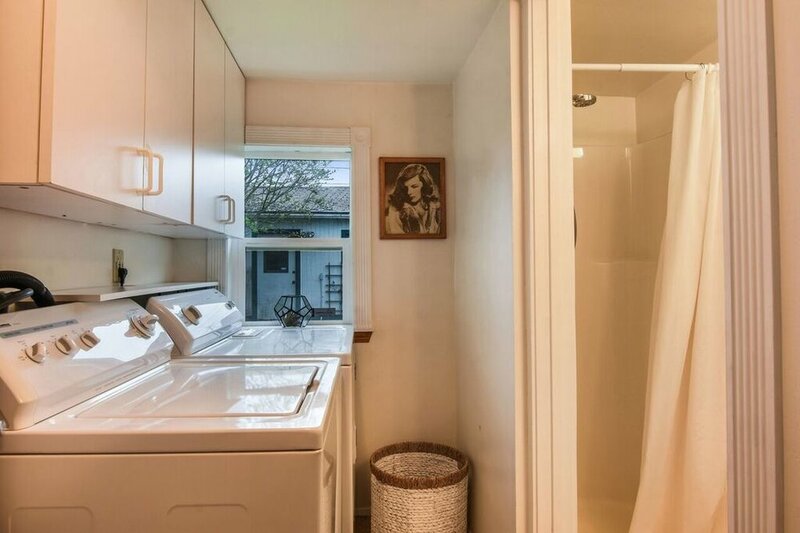 Laundry room adjacent to the kitchen. Also getting a look into the 3/4 bath. 3/4 bath with shower accessed from the laundry room adjacent to the kitchen. Water heater is behind the bamboo curtain. One of two second floor bedrooms with tall windows and carpeted floor. The 2 bedrooms in this home are tucked upstairs where its cozy and quiet. Painted white and carpeted in neutral tones, they'll take any color scheme nicely. One of two second floor bedrooms. Second of the two upstairs bedrooms. Notice the details under the eaves, beautiful hints of the Victorian era of the home. I love the Victorian details under the eaves here above those bay windows at the front of the house. This covered porch is a nice spot for potted plants and a convenient place to stop and shake off your coat before heading in. The carefully landscaped front yard is only the beginning of what the yard and garden offers. In the back there's a low, two-level deck off the kitchen. A paved path bends gently toward the 2 car garage at the back of the lot, and the edged lawn curves along beside mature plantings bordering the fence. This backyard promises to be a retreat space in summer. Backyard with edged lawn, paved path, and mature landscaping. Two-level deck with a door into the kitchen. Double car garage shown in the background. Raised garden bed in the side yard with paved path to the gate. 2 car detached garage with shop space. The Hilltop Neighborhood, where you find this home, is a diverse community set on the hill above Tacoma's downtown. Churches dot the corners, the recently beautifully renovated McCarver Elementary School and its playground are just a few blocks away. St. Joseph's Hospital and Community Healthcare's Hilltop Regional Health Center are close by. There's even a Link light rail project in the works, to be completed in 2022. The closest station will only be about 3 or 4 blocks away! Go for music and art at Alma Mater, or coffee and brunch at Honey. Find some green space at People's Park, get to know your neighbors at the People's Community Center, and enjoy the annual Hilltop Street Fair every August. The heart of the Hilltop's business district stretches between S. 19th and S. 9th on MLK Way. Favorites on MLK include The Fish House Cafe, a tiny blue restaurant serving fried fish and shrimp baskets for decades, Johnson's Candy Company(since 1949! ), Pho Bac and Pho King offering inexpensive Vietnamese food. Newer additions to the neighborhood like Red Elm Cafe, 2nd Cycle Community Cycle Center, and bars like The Eleven Eleven Bar, Zodiac Supper Club, and 1022 S J (craft cocktails and food too) indicate the changing character of this area. Just one more peek at those all ceilings, bay windows, and fir floors at the front of the house. I'll be there, ready to answer your questions and talk more about this house, Tacoma, the neighborhood, and all it has to offer. See you soon! Craftsman lovers, we have another classic for you! From a covered front porch to oak floors, ornamental ceilings, and built-ins, this home is a beauty. Full baths on 2 levels, and a fully fenced yard. 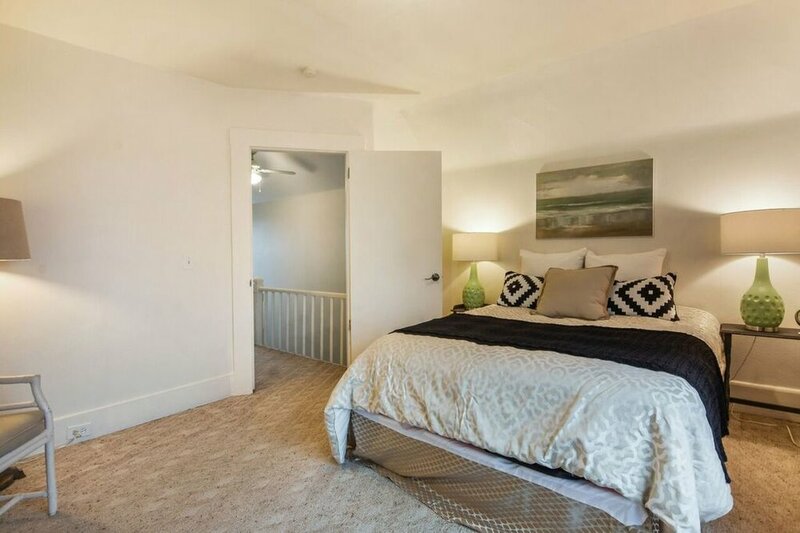 The live-in basement with separate access, family room, laundry, bath, and bedroom offers amazing flexibility. Blocks from Hilltop’s Business District, and 1 mile from downtown museums. If you’ve been dreaming of a spot to settle down, someplace sweet and bright, something from the days of hardwood floors and covered porches, this one’s for you. 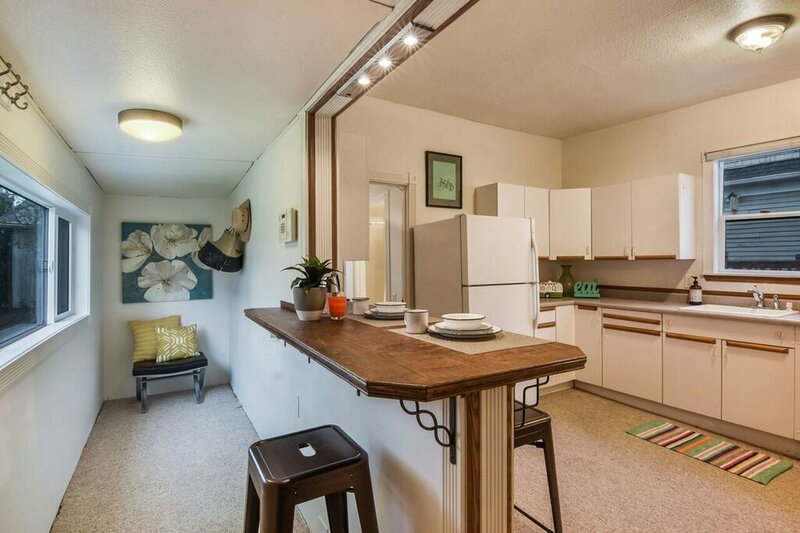 Four blocks from the walkable Lincoln International District and just 5 minutes from downtown. Location and enduring style meet in this beautifully crafted home just 2 blocks from the University of Puget Sound. 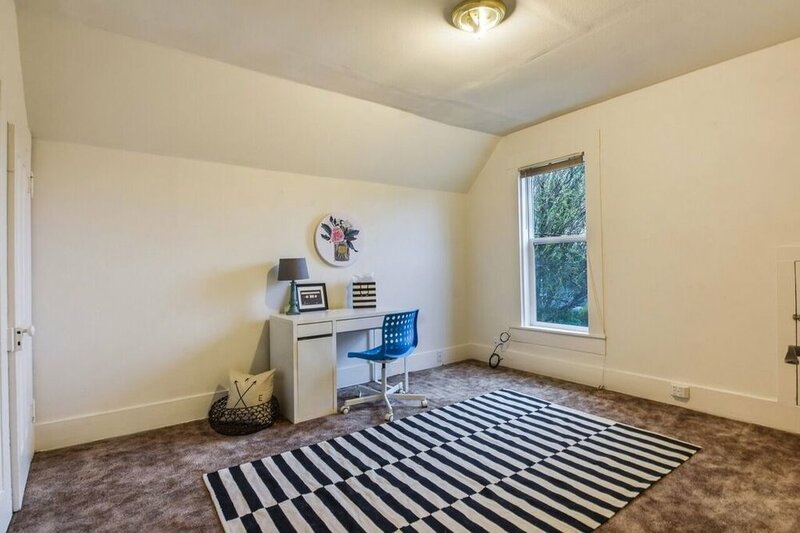 Original details include built-ins, wainscoting, boxed beam ceiling, pocket door, and glowing fir floors. A finished basement expands the living space. Walk to Proctor and the 3 Bridges District! It’s hard to find a cozier spot than this single-level with its solid hardwood floors, big windows, and a perfect backyard patio. The location just makes it sweeter; it's less than a mile to the heart of Proctor, not to mention it’s just a quick walk through the park for some Valhalla Coffee in the mornings. 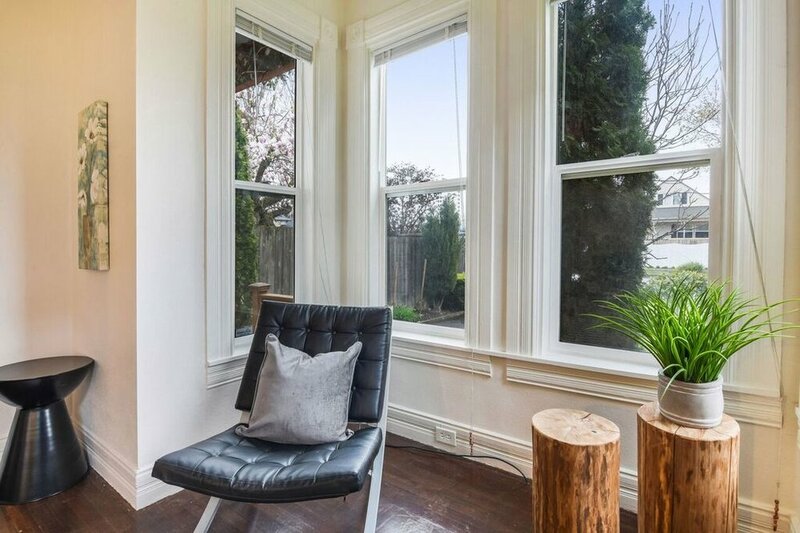 This tastefully updated Victorian is just half a block from Wright Park, near all Stadium and Downtown have to offer. New hardwood floors, tall ceilings, and bay windows. The plumbing, electrical, and drywall are all redone bringing this elegant home up to date. Air conditioning too! Convenient updates and original character combine to make this well built and lovingly maintained home a treasure. A finished basement greatly expands the living space while outdoors mature landscaping and a private backyard patio beckon. 5 minutes or less to groceries, library, I-5, restaurants, and parks. Newer PostTacoma Arts Like Crazy! Hi, I'm Michael Duggan. I would love to help you through the home buying or selling process. Please contact me to set up a meeting and get things started.